Grewelthorpe: School History Part 1. Grewelthorpe School History. Part 1..
A Mrs. Lawrence, land owner in Grewelthorpe gave a parcel of land known as Dinah Garth for a village school. This was in 1837. This building was erected in 1842 and it was known as a Dame School. In 1851 Mr William Pickard. a schoolmaster and his wife Sarah lived in the village and they had 4 children of their own and 6 children who were boarders, This could have been a private school. They were still in Grewelthorpe in 1861 but now they only had 4 children living with them. William died in 1867. There was no schoolmaster in the village in 1871, but on the 1871 census the enumerator has indicated where there is a boys and girls school between 2 houses. The Grewelthorpe National School. started in November 1876 in the same place as the Dame school. There were 54 children on the register in November 1876. Followed by another 15 in January 1877. Some of the children had been taught privately some had never been to school before. Some had been taught previously at Kirkby Malzeard and some at Masham. Ages ranged from 4yrs to 12yrs. The first Master was John Myers. The school affairs were run by managers which included the vicar. The vicar was the Rev. W.H.Oxley. Other managers were Wm. Jackson: Thomas Gill: W.J.Beill [Treasurer]. In 1877 there was a flurry of activity in getting the school ready. W.J.Croft. a plumber and glazier from Kirkby Malzeard had replaced 20 squares [presumably glass panes] in the windows. They cost 11/6d. Charles Lofthouse. provided a Childrens platform, a wooden screen with canvassing, a Blackboard and stand, and he charged 2/6 for fixing desks and repairing the floor. He also provided a lock for the Master’s desk. His bill was £3.18s.2d. The managers ordered reading books, slates, pens, chalk, a log book and register, inkwells, music paper and blotting paper. All this was ordered from The Northern Educational Trading Company in York and amounted to £3.6s.7d. It was delivered by train to Ripon to be collected. Also they placed an order with The National Society’s Depository in London for A map of Europe, A map of the World, A map of the British Isles. A new map of Palestine, An illustrated alphabet, a script alphabet, an abacus, correspondence pens and millboards. All this cost £4.4s including 1/6 packing. Again this had to be collected from Ripon railway station after having been shipped by the North Eastern Railway. In 1878 we read in the masters log book that alterations had to be made to the privies. The school walls were whitewashed, and the classroom measured Height 15ft, Length 36ft, breadth 18ft. The room was heated with a fireplace and the lighting would be oil lamps. Recorded in the Leeds Mercury newspaper May 1882. On Whit Monday 1882 The Grewelthorpe school children met up with the Masham Church Sunday school children, their teachers and friends & the Masham drum & fife band at the invitation of the vicar the Rev Kruckenberg. After a short service in the church and a march thro the village they were taken to Hackfall where they were regaled with refreshments and spent a very pleasant afternoon in amusements. The children connected with the Primitive Methodists also had a treat, and walked thro the town singing hymns. In 1883 there were 64 pupils on the register. A copy of the school account shows us what the teachers required for lessons. Suppled by James Wood a bookseller, stationer and newsagent, possibly from Masham. 1 metalic piano and 1 box of bricks 2/8d. 18 Stories of history. 15/- ditto No 1 18/-. 18 ditto No2. 22/6d. 12 ditto No 3 18/-. 3 quires of ruled foolscap 3/-. 30 English classics, Byrons Prisoner. 5/-. 6pkts of test cards. 6/-. The bill came to £12.6s.7d with a discount of 10/7d. Total £11.16s. In 1884 extensions were built to the classroom, a porch was added. The work started after the midsummer holiday. In November school was closed for the day whilst masons made the new doorway from school to classroom. In this same year the wall behind the school had to be rebuilt as it had collapsed during the Summer. In 1889 Mr.G.Leathley. owned The Garth. Part of this was taken to enlarge the school. Rent charged was £1 per annum. Also made the field behind the school into a playground. In 1893 the school was made free. When it started it was 3d per week. This changed to 6d per quarter. In 1894 the school inspector remarked on the improvement in the schoolrooms appearance by the colouring of the walls and the handsome cartoons on them. In 1895 the Master complained that the school was cold. The fireplace was blocked up and a combustion stove fitted. It cost 82/- and was supplied by Messrs. Dixon of Ripon. There was constantly a problem dealing with the fire in the school. There had to be a supply of kindling and sometimes the children were asked to collect sticks. In 1895 the managers were asked to pay for Wm. Moore. gathering sticks together in the Hackfall one day at 2/6d. C.Wilson. for carting the sticks 5/-. In 1896 Mr. Ascough. was paid to supply kindling. In 1902 the school caretaker’s husband Mr. Pickles. offered to supply kindling for 12/- per annum. Mr. Taylor. supplied coke for the stove. His bill in 1902 was £1.1s.8d. There was a complaint about the drain near the school gate which was full of sewage and had an obnoxious smell which was dangerous to the health of the children. Wm. Moore. charged 3/6d. to fit a new grate, which had been obtained from Jno. Metcalfe. for 1/6d, near the classroom door. J.Calvert. charged 6d. for removing gravel from the school yard. In 1900 £5 was given to the school to improve the cloaks and lavatories. In 1902 it was agreed to concrete the school playground. The Marquis of Ripon was asked for a gift of gravel. In 1903 the managers asked Alderman Spence of Ripon to give stone to make steps. These were probably the steps that led up to the top field where the infants classroom was later built. At this time the school size was recorded as Large Room 18ft x 36ft. giving space for 81 scholars. Class room 12ft x 18ft. space for 27 scholars. The average attendance for 1903 was 75 scholars. Following this Mr. J.Leathley. Painter & decorator of Grewelthorpe was asked to provide an estimate for painting the school. His specification was for whitewashing with lime the ceilings in the schoolroom and the classroom. The walls of the large room, classroom and entrance to be coloured blue, grey with Duresco? Two out closets to be whitewashed with lime. Lavatories to be limewashed. he agreed to do all this for £1.15s.0d. In 1905 a school improvement plan was agreed and Mr.Thomas Richmond. of Kirkby Malzeard gave a tender for the work. A Building Fund was created and the managers asked for donations. It was agreed to charge for the use of the school for entertainment. 3/6d for funds and 1/6d for the cleaner. A sale of work raised funds. In 1906 the school was valued at £800. In 1907 it was reported that the offices [toilets] had been rebuilt and cloakroom accommodation improved.[Mr. Richmond. had replaced hat pegs and he was asked to re-plaster the damp wall in the girls lobby.] There is no provision for artificial lighting in the infants room. The main room is warmed by a stove & long pipe. Cleaning is not quite satisfactory. Desk accommodation is still inadequate and more cupboard room is needed. The gallery in the infants room might be removed with advantage. In 1909 the gallery in the infants room had been removed and dual desks have been supplied also some dual desks for the older children and a new cupboard. Ventilation has been improved. Cleaning is still not satisfactory, there is much dust on ledges and tops of cupboards. A lamp is needed for the infants room and no oil has been supplied. A better place for storing firewood is also desirable, at the inspector’s visit the cloakroom was full of it. The school is practically full, the number of children on the books is in excess of the accommodation. [At this time there were over 80 pupils registered]. There is little space in the infant’s room for games. In 1909 John Metcalfe. repaired desks and an outside rail. In 1910 a shed was erected outside to store firewood. In 1911 Jennie Richmond. organised a concert which raised £2.10s.6d for school funds. Inspectors reports on staff & lessons. In 1892 he reports that the children are bright & intelligent and should do reasonably well in the Leeds Inspectors exams which obviously had some bearing on the grant the school received. In 1893 Mr. Lees reported a slight improvement. He said the school needed another easel, blackboard. Globe and compass. These should be in place before the Government exam. He remarked on the schools high reputation. In 1896 Mr. Lees commented on the deterioration of the work in school. The school had a new master Mr Halliday. and the inspector refers to changes in the work. The infants however got a good report being well taught, he thought the mistress should aim for a higher quality of work and they should be sent up into Standard I under age if able. In 1898. His report is not good. The school has suffered greatly. It is very mechanical and has deteriorated in quality and style. However the infants continue to be well taught. He implies that the fault is with the previous master and that Henry Ferriday. who has taken over will bring back the standard of excellence. The school had suffered from continual absenteeism and illness. No record of Inspectors reports now until 1904. Another change in Master. Frederick Pickles. has taken over. The Inspector Mr F. Hewitt. says the school is ably managed but conducted under unsatisfactory conditions. In Jan 1905 he reported that the Master had 56 children to teach assisted by a monitress. More efficient help is needed. There were actually over 80 pupils on the register. In Aug. 1905 he noted that the staff had been strengthened and in spite of adverse circumstances there has been distinct progress. And the school promises to do well. The overcrowding of the infants room during sewing lessons should be avoided as far as possible. Cupboard accommodation is inadequate and the offices [toilets] should be kept cleaner. Report Sept. 1907. The increased staff had been maintained and the organisation is now satisfactory.The children are orderly but do not take sufficient interest in their work with the exception of Standards 6 & 7. The Master & his staff are industrious and the work is satisfactory. In Mental arithmetic the children are slow. practical mending [needlework] should receive more attention. The children are in good order. The composition of the staff gives the Headmaster a large class, especially at the beginning of the year. The work is carefully planned, but is hoped that rather more detailed reports will be made on the progress of individual children, and that weekly forecasts of work asked for previously will be kept. Some of the older children are classified rather low for Arithmetic and while opportunity is given to the most advanced children for silent study. I understand that the text books for their use, applied for in the last requisition have not been granted. Homework is done in winter by the oldest children and a scholarship has been obtained. reports have been made to parents on the children’s progress and a parents day has been held. The children have evidently been trained in the habits of industry and attention. Speech training is practised and the children in the lower group are pretty ready at continuous oral narration, but children generally might answer more audibly. Written composition has improved, a good deal is done, and the children write a satisfactory amount in a lesson. There is no library, but readers and good poetry books have been supplied and the master is framing a scheme by which the children are to buy books for home reading. The Head teacher’s Annual report of 1911 states. The work during the year has been greatly interfered with. The late teacher took no interest in her class, and neglected it badly. After she left the class was for nearly 3 months without a teacher. This extra work thrown on my hands necessitated partial neglect of the Upper Division. Thus neither class is quite up to our usual standard. Miss Gowing the new teacher for the Lower Division is working well, and everything at present promises an early return to our usual standard of work. The 1912 report says that the master & staff are doing well and sound progress is being made. the children are orderly and quiet, well behaved & interested in work. Reading is good. There is no school library but the home reading scheme of the West Riding is in operation. Handwriting is rather poor. The children have good voices and sing with taste. Drawing good, Needlework satisfactory. The darning of woollen garments is particularly good, but great difficulty is experienced in getting parents to send garments to school to be repaired. A fairly comprehensive scheme of nature lessons has been drawn up, but there is perhaps some danger of the immediate environment of the school not been taken sufficiently into account in the teaching. The infants are brightly and pleasantly taught. They are making good progress on the whole, altho number is a rather weak subject. They are rather shy & backward in talking except about fairy stories, in which they are much interested, and which they are fond of telling & illustrating with crayon on paper. Some verses not worth the trouble have been committed to memory, but a better selection will be made in future. In 1878 Mrs Coldbeck the sewing teacher began to teach Latin & French to the monitors. In 1882 the managers ordered that the girls would be taught sewing every afternoon from 2p.m. to 3-30p.m. In Jan 1891 the children had their first drawing lesson. The master said they would be taught drawing every Thursday & Friday afternoon from 2p.m. to 2.50p.m. In Sept 1894 the children used coloured crayons for the first time. They also did cutting out and toy making. In March 1899 the teacher took pupils into Hackfall woods for a Geography lesson for the first time. In 1909 Dressmaking classes were very successful and a sewing machine was requested. The master also requested a set of apparatus for scientific experiments in school. This was received in March 1909. In 1910 the Master was successful in obtaining a weighing machine and a measuring standard. To be used in science lessons. In 1911 General & Mrs. Dalton. gave a prize for the best sewing done in school. Lessons on the curriculum in 1912. In 1911 the first parents day was held. The school was open for inspection from 3-4p.m. About 20 parents turned up. For the last 15 minutes the children sang for their visitors. Sept. 1911. First record of a fire drill. The school was cleared in less than a minute. 1912. When the head teacher Mr Pickles was away the shool had to close because of lack of staff. In 1913 Mr. Jowett. bought a piano for the school. A new clock installed. In April 1913 the school was broken into and a few articles stolen. 2 schoolboys were implicated and punished. library. Books were added now and then and in Dec 1914 there were 80 volumes. In 1915. A Miss Newsome a lady from Leeds who was visiting the village came to school. She was an excellent elocutionist and the Master asked her to take the Poetry lesson. The children enjoyed an interesting and amusing half hour. 21st Oct 1915. 110th Anniversary of Battle of Trafalgar. The head addressed the school about this and the present war. This day was chosen as Our Day by the Red Cross society and little flags were sold to every child. 6/8d raised for the fund. 2 Dec 1915. “Sailors Day” in Ripon. Pansies were sold to children and 5/4d raised for sailors charities. Christmas 1915. Each child was presented with a Christmas cracker. May 1916. Shakespeare’s tercentenary. The Master gave the children an account of William Shakespeare’s life & works. Also selections from Henry 8th etc. Bad weather affected the school. Some of the children that lived on the outlying farms at Bramley Lane and Bramley Grange had to walk to and from school. 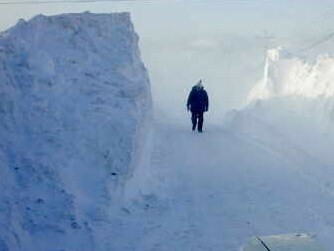 Every year from January to March and often earlier or later than this the school was disrupted by heavy falls of snow. In 1885 several boys were caned for being late to school because they had been skating on the pond. The winter of 1886 was very bad. Heavy falls of snow kept pupils away. On March 3rd there was a fall of 3-4ft. Only four children made it to school and on one day nobody turned up. In Feb 1900 the school was closed for a week because of severe snow. In August 1904 The master closed the school because the children that made it to school in torrential rain were soaked to the skin. Rain also affected the school because it stopped physical exercises which were held in the playground. November 22nd 1904. During the night there had been a very heavy snowstorm and in the morning it was also very wild. Only 16 children made it to school and they were not in a fit state to stay because they were all so cold and wet. School closed for the day. May 1905. The Master wrote “Owing to insufficient and bad arrangement of the drains, the school was flooded this afternoon during a thunder shower” The next day the school floor was still very wet. August 1906. The school room was too hot. The temperature had been above 80 degrees all week. September 1909. A severe storm came on very suddenly during the dinner hour. and many children coming to school were caught in it. A few were drenched and had to be sent home. 1909/10 The winter was very bad with heavy falls of snow. Feb 1916. Gales brought the chimney pot and several bricks down. Before the time of vaccinations to protect children from childhood illnesses, there were regularly epidemics which would sweep through the village, quite often closing down the school. 1897. Scarlet Fever. The school closed for 6 weeks. 1898. Scarlatina. The school closed for 3 weeks. 1905 Whooping Cough. Teacher contracted Diphtheria. 1906 Scarlet Fever. This outbreak started in houses close to the school and many parents refused to send their children to school. 1907 Measles. In September only 25 scholars present out of 92. School closed for 3 weeks. 1912 Mumps. Only 16 children attended in Jan. School closed for 3 weeks. 1914. Several families had children with “unclean heads” The MOH from Wakefield came to the school and visited the homes. This was obviously taken very seriously as some of the children were not allowed to attend school. This went on for several months. 1915 Influenza & Chicken Pox. School closed for 4 weeks and disinfected before reopening. Later cases of Scarlet Fever closed school for another month. School would be on holiday on Shrove Tuesday[Half a day], 1 week at Easter. 1 week at Whitsuntide. 4 weeks Mid Summer. 2 weeks at Christmas. Village feast days. Grewelthorpe feast was held over 2 days in September. In June 1887 they celebrated the Queens Jubilee. In 1892 the school had half day off to visit the menagerie in Masham. Children took time off to go on the Sunday School excursion each year. Aug 1903 and every year. Days holiday for the Church & Wesleyan Choir excursion. Sept 1903. School closed early so that the Sunday school children could go to the vicarage for tea. School closed for the day for Parliamentary elections. [The school was used as polling centre]. Children took unofficial time off for Hay making in July, Picking Brambles in September, Potato Picking in October, Kirkby Malzeard flower show, Masham Show, Masham Sheep Fair in September, Martinmas Hiring day in November, Cattle sale in February 1904. June Fair in Ripon. May 20 1910. Closed school for the day because of the King’,s funeral. June 1911. Closed for 2 days for the Coronation. Another 2.5 days given in November. Feb 1914. Half day for induction of new vicar Rev. W.G.Howard.